Online attack ads go viral, but are they viable? The most outlandish political advertisement in recent memory goes something like this: The U.S.S. Constitution floats down a river, heading toward a waterfall’s edge. President Obama grips the ship’s steering wheel as passengers toast bank bailouts and “free health care for life.” Below decks, cute-but-despondent child slaves pull oars. A man in a Guy Fawkes mask cradles a pot of cash. A woman in a bathtub mentions a “stimulated” solar company. 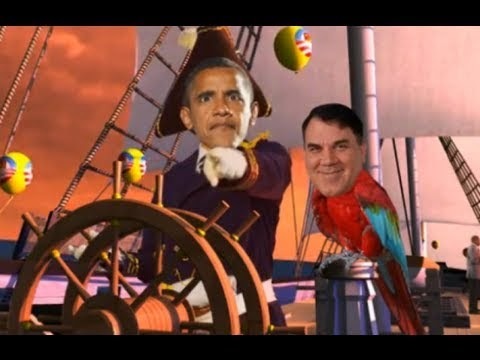 Also, the disembodied head of former Rep. Alan Grayson, Florida Democrat, appears superimposed on the body of a parrot. Officially a pitch for Mark Oxner, a Republican congressional candidate in Florida’s new 27th District, the online spot ostensibly serves as a 39-second visual metaphor for the shortcomings of the Obama administration and the dangers of the national debt. Mixing computer graphics and live actors, it resembles either a big-budget video game or a shoestring Hollywood film — starring a chimerical parrot. Amusing, offensive and just plain odd, the ad is less “Morning in America” than Monty Python, the sort of thing a viewer feels compelled to watch more than once, and then pass along to friends. Which, by the way, is the intended effect. “If it doesn’t go viral, nobody is going to see the message,” said Ladd Ehlinger, the 42-year-old Alabama-based filmmaker who produced the spot. “The wedding videographer who occasionally does a campaign ad making a candidate look like Knute Rockne doesn’t quite work online,” he said. “I can’t tell you how many ads made with the television mentality are just sitting out there on the Internet with 60 views. Bore not, lest ye go unclicked. A commercial from Michigan Republican Senate candidate Pete Hoekstra’s campaign that features an Asian woman riding a bike through a rice paddy and thanking Democratic incumbent Debbie Stabenow in broken English for helping China with her “reckless spending” has nearly 1 million YouTube views and aired statewide during the Super Bowl, drawing bipartisan national criticism for being racially insensitive. Carly Fiorina’s ill-fated 2010 California Senate campaign is best remembered for an online ad that depicted Republican primary opponent Tom Campbell as a fiscal-conservative-in-name-only “Demon Sheep,” complete with a human actor in a sheep costume scurrying around on all fours, eyes glowing red. The most talked about — and most widely mocked — spot of the current Republican presidential primary was Herman Cain’s “Smoking Man,” in which footage of campaign aide Mark Block touting his candidate’s virtues and taking a deep drag from a cigarette gives way to an uncomfortably long shot of Mr. Cain grinning impishly. “These ads are attempts to cut through the clutter,” said Tim Groeling, chairman of the Communication Studies Department at the University of California at Los Angeles and an expert on political ads.”If you’re Mitt Romney, you don’t need to be doing that right now. You have standard, safe, controlled ways to get messages out. Mr. Oxner had a choice. A 50-year-old businessman with few Republican party connections and no previous political experience, he could have filmed a conventional campaign spot, touting his entrepreneurial successes and conservative political beliefs — all of which would have made him just like every other small-time, no-name GOP congressional candidate. Instead, he decided to punch up, teaming with Mr. Ehlinger and taking inspiration from Mr. Cain and George Washington — no, really — while taking on Mr. Obama and Mr. Grayson in the most gonzo, eyeball-grabbing way possible. “Sometimes I’ll ask people, ‘Hey, can I come speak to your group?’” Mr. Oxner said. “And they’re like, ‘Who are you?’ For someone in my place, fighting the old traditional campaign is not to my advantage. According to Mr. Ehlinger, screwball ads are best deployed by insurgent, underdog candidates, largely because any national exposure — positive or negative — increases their local stature. Case in point? Mr. Ehlinger’s 2010 spot for Alabama agricultural commissioner aspirant Dale Peterson inspired coast-to-coast mockery and incredulity for portraying the candidate as a straight-talkin’, horse-riding’, shotgun-totin’, smokeless Marlboro Man incarnate — but it also collected millions of YouTube views and dozens of television mentions, catapulting Mr. Peterson from single-digit polling numbers to 28 percent of the vote in a three-way race. A second ad produced by Mr. Ehlinger for former Alabama congressional candidate Rick Barber — in which Mr. Barber pledges his fealty to the Constitution and laments the tyranny of the Internal Revenue Service to an actor portraying Washington, who coolly tells the prospective legislator to “gather your armies” — drew a heated televised rebuke from liberal broadcaster Keith Olbermann. In short, he played right into what Mr. Ehlinger calls a “briar patch” strategy — deliberately antagonizing political opponents into attacking his candidate, the better to rally sympathetic partisans to their defense. For candidates like Mr. Oxner, online ads also are cost-effective. While television airtime is expensive — and becoming more so in an age of corporate-funded super PACs — Internet distribution essentially is free. Click a button, upload to YouTube and let bloggers, news websites and social networks do the rest. According to a Pew Research Center survey conducted last year, the number of Americans who say they consider the Internet a main news source more than doubled over the previous decade, rising from 13 percent to 41 percent. Over the same span, the number of people who consider television a main news source dropped from 74 percent to 66 percent. The trend was most pronounced among 18-to-29-year-olds, with 65 percent citing the Internet as a main news source and 52 percent citing television. “There’s no longer a question that they should be a component of any campaign,” she said. Perhaps unsurprisingly, the most controversial spot Mr. Ehlinger has produced involves an assault rifle, dollar bills, a blood-red horror-movie font and a stripper pole. Plus the now-infamous Twitter image of Anthony Weiner’s bulge. Created last year to support tea party challenger Craig Huey’s race against former Los Angeles City Council member Janice Hahn for a vacant seat in California’s 36th Congressional District, the ad attacks Ms. Hahn’s support of a local gang-intervention program by having two gun-toting black rappers sing “give me your cash, [expletive], so we can shoot up the streets,” while slapping the jiggling rear end of a white female stripper sporting Ms. Hahn’s superimposed face. Viewed charitably, the spot is a clumsy spoof of 1990s rap-video cliches, wrapped in a bow of sophomoric sexism. To a less sympathetic eye, it’s racist and misogynistic. Though Mr. Ehlinger describes himself as conservative, he is first and foremost a provocateur, straight from the Alfred E. Neuman school of spitball hurling. In that sense, he’s decidedly a man of his medium: On the Internet, crass, button-pushing, non-sequitur humor is the order of the day. Mr. Ehlinger once created an attack ad that featured the head of Rep. Barney Frank, Massachusetts Democrat, superimposed on a dancing body. Why? Because Mr. Ehlinger thought it was funny. His “Turn This Ship Around” spot for Mr. Oxner contains a two-bathtub visual reference to erectile-dysfunction drug commercials and apes the style and tone of a computer-animated Taiwanese news-spoof series that is exceedingly popular online. Mr. Ehlinger never planned on becoming a political activist. He grew up wanting to make movies, majoring in communication at the University of New Orleans. After working for NASA and the U.S. Army Space and Missile Defense Command as a computer animator, Mr. Ehlinger founded a digital-rendering firm and made a pair of animated films, one of them the story of a conservative talk-radio host trapped in a post-apocalyptic world of liberal zombies. (Don’t ask). While hosting a real-life radio program in Huntsville, Ala., Mr. Ehlinger met congressional candidate Les Phillip, who asked him to create an online ad. “An ad that works has to have a good guy and a good villain,” Mr. Ehlinger said. “You have to find something that people are afraid to say, but believe. You have to be humorous somehow. Following its release, Mr. Oxner’s ad was denounced as insensitive and racist for portraying Mr. Obama — a man with African heritage — as the captain of a slave ship. Mr. Oxner insists the spot was not intended to offend and that the connection to slavery did not occur to him during its production. He also has neither apologized for, nor pulled the ad, which subsequently has been used by two black Republican candidates, Connecticut Senate hopeful Brian Hill and Maryland congressional aspirant Glenn Morton. Is Mr. Ehlinger’s brand of online trouble-stirring a viable political strategy? That remains an open question. Long shots from the start, Mr. Phillip, Mr. Peterson and Mr. Huey ultimately lost their races. So did John Dennis, who ran against former Speaker of the House Nancy Pelosi in 2010 and is again campaigning for a California congressional seat this year. Working with Mr. Ehlinger, Mr. Dennis ran an online ad that parodied “The Wizard of Oz,” casting an actress who resembles Ms. Pelosi as the Wicked Witch of the West. Nevertheless, Mr. Dennis declined to use a second spot that spoofed James Bond films. For Mr. Ehlinger, of course, serious is a relative term. Given the opportunity, he said, he would love to make videos for the current Republican presidential candidates. Picture Newt Gingrich as Dr. Evil from the “Austin Powers” film franchise, he said, flying around in space, building moon mirrors. Or Mitt Romney as Robby the Robot, receiving his instructions from bankers and health insurance companies.